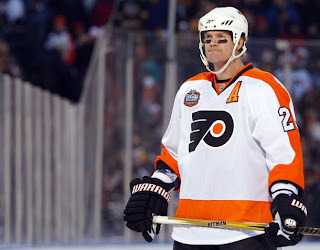 News broke Thursday that Philadelphia Flyers captain Chris Pronger will not be playing for the rest of the 2011/2012 season. It’s been reported that he is suffering from severe post-concussion syndrome. Things started going downhill for Pronger when he hit in the face with a stick on October 24th. He missed six games and 16 days after that. He did come back to playing, but when you play as physical as he does, you’re going to take a couple smacks to the head. The symptoms persisted and now he is done for the season. Hockey fans are a loyal and sometimes ruthless bunch. I’ve seen some comments about karma and mentions of how ironic it is for such a dirty player to be injured. He is one of those players that spends a lot of time in the penalty box. I like watching Pronger, I like the way the Flyers play. I like that the Flyers are stepping up without their Captain and still getting the puck in the net. I hope Chris is able to overcome the post-concussion symptoms. Not just because I’d like to see him play again, but because I can’t imagine what it would be like going through life dealing with them.